The following 12 Sanskrit words can help illuminate your holiday yoga practice and meditations. As we move now toward the shortest day and longest night of the year (in the Northern Hemisphere), let’s take a deeper look at yoga teachings on light and darkness and explore what they have to say about light within and without, body and mind, the transient and the eternal. Though for us moving toward the Winter Solstice light is now diminishing, yoga philosophy suggests there is a light within that never wanes. First, let’s introduce two ancient Sanskrit words: The ancient yogis saw our being as spiritual creatures made up of (word #1) prakṛti [prak-rit-ee] and (word #2) puruṣa [poo-roo-sha]. Prakṛti is our body (it is also a word used to mean “nature”). It is all that is changing in us, or, in other terms, and this is not always obvious: the body-brain system. It is not always obvious because we identify with something that is changing, thinking that it is something permanent. Puruṣa is the light that never wanes. Now a third and fourth Sanskrit word: Patañjali (#3), who compiled the Yoga Sutra-s sometime around 350 CE, uses the word īśvara (#4) to mean a Higher Power. Iśvara is the source of light, or pure awareness or consciousness; through puruṣa (our individual light as experienced by us), we are connected to this one light, the source of all light, awareness, consciousness. So, the interesting question arises, if reality and our relation to reality is constructed like this, how is darkness possible? How can depression, wrong action, confusion, illness, a sense of disconnect from light and wholeness, arise? This is an ancient question, and a living one. Here are some things to ponder from the yoga teachings and their related philosophies. These are suggestions we can more than ponder, but test in our own life and in our yoga practice to discover for ourselves what they might mean. Sanskrit word #5 is prāṇa, or life force. The ancient yogis saw health as a smooth flow of prāṇa within the body-brain system. Since our body is made of matter, it has limitations or a conditioned nature. We experience that conditioning, yoga suggests, through the guṇas (#6), or tendencies. The guṇas influence matter very strongly. Just as electricity can’t pass through wood but it can pass through copper, the body’s receptivity to prāṇa will change. According to yoga, the guṇas govern this receptivity. The guṇas are sattva (#7: balance, order, purity), rajas (#8: change, movement, dynamism) and tamas (#9: lethargy, dullness, slowness). To bring this full circle and to see the interconnected, holistic view of reality to which yoga is inviting us, the guṇas also qualify the seasons. Sattva is the springtime, with it’s creative potential, and all that blossoms with it. Rajas is the summer, it is hot, people move around and travel. Tamas is associated with fall and winter as it gets darker and colder. The seasons are a reflection of the guṇas of the world. When people talk about nature or the environment, we usually understand it to be the external world. However, according to yoga philosophy, the internal environment is just as or even more important than the external. In the moments when we are feeling less receptive to the light within, it doesn’t mean the light is not there. Our receptivity is different in accordance with our state of mind. Yoga suggest that deep inside us there is always light. That is why Patañjali advises us in Yoga Sutra I.36 to meditate on the light within. Viśokā (#10) literally means “no despondency.” When grief is sustained it becomes despondency. Everyone has bad experiences in their lives, but when we identify with those past experiences we negate our reception of light. According to yoga philosophy there is always an inward resource. Jyoti (#11) is our inner light, and jyotiṣmatī (#12!) means “to focus on the light within.” Despondency may transform when we pay attention to the light inside. In times where we feel darkness or depressed, we don’t need to search outside, the yoga teachings suggest, we can be inspired by the source of light inside. The next time you are in a state that feels disconnected, try your yoga practice. Did that feeling turn out to be reality, or does it change when your body-breath-mind state changes? The teachings of yoga seem to be suggesting something further as well, beyond helping us return to equilibrium. Here seems to be a key point: both suffering and joy are only possible in something that changes. When you begin to become sensitive to the transient, changeable nature of prakṛti, you might ask, what is it that lies beyond all the changes, what is the source of both light and dark? What is there that never changes? That may be the most eternal quest. 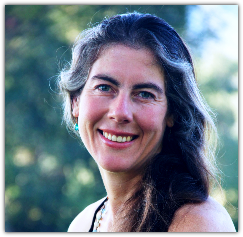 Rowan Lommel is a Yoga Teacher & Yoga Therapist and founder of the New School of Yoga for yoga teacher training.